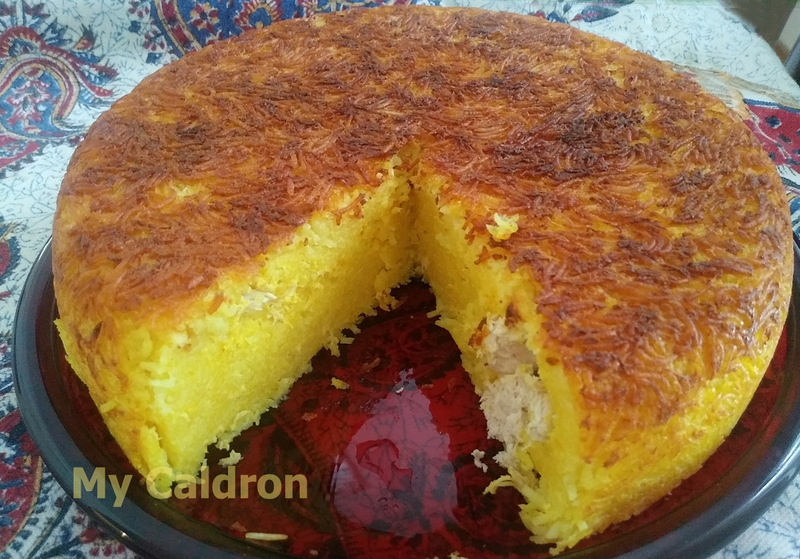 Tahchin ته‌چین is a traditional Persian dish which is very unique in its taste and texture – a dense dish flavored with yogurt, saffron and thick yogurt and typically layered with chicken chunks. 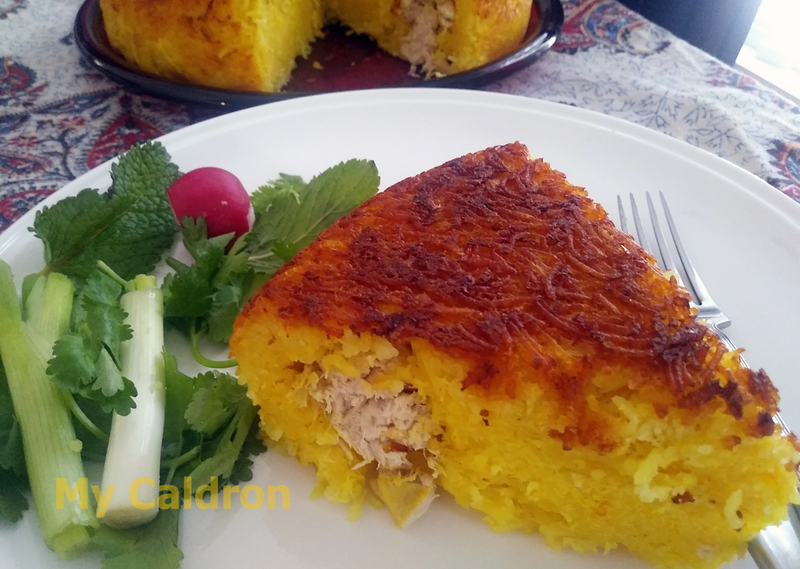 The delicious thick golden rice crust (tahdig) formed at the bottom and around the cooked tahchin is its shining feature. An original tahchin is stem-cooked in a pot (a non-stick one in this case) over gas or electric stove just like any other Persian mix rice; however since the amount of liquid in the rice makes its cooking behaviour a bit different and complicated, a lot of recipes advise you to “bake” the dish instead using Pyrex dishes in the oven. Well, I never went with baking style and after many years of trying and failing the traditional pot style, last summer I finally succeeded in getting it right – thanks to my beloved auntie visiting form my old hometown Shiraz. 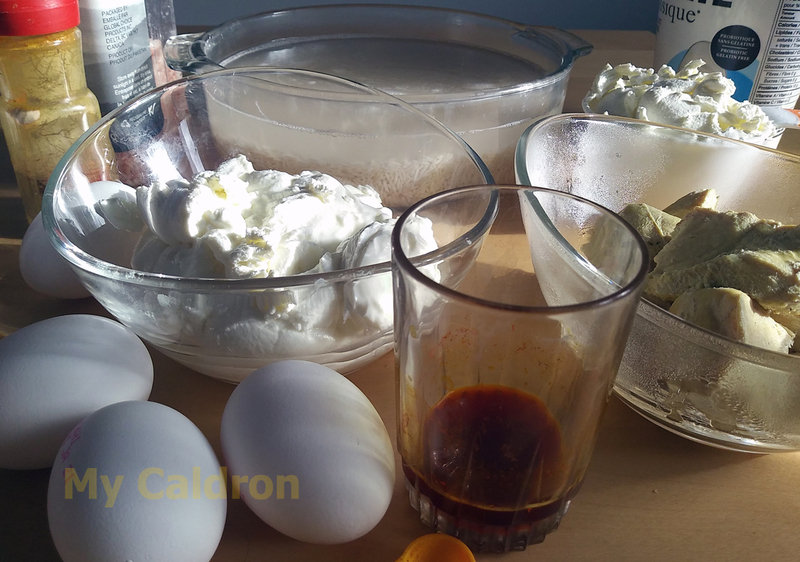 *Some use egg yolks only to get a less sticky tahchin. I should yet try that. 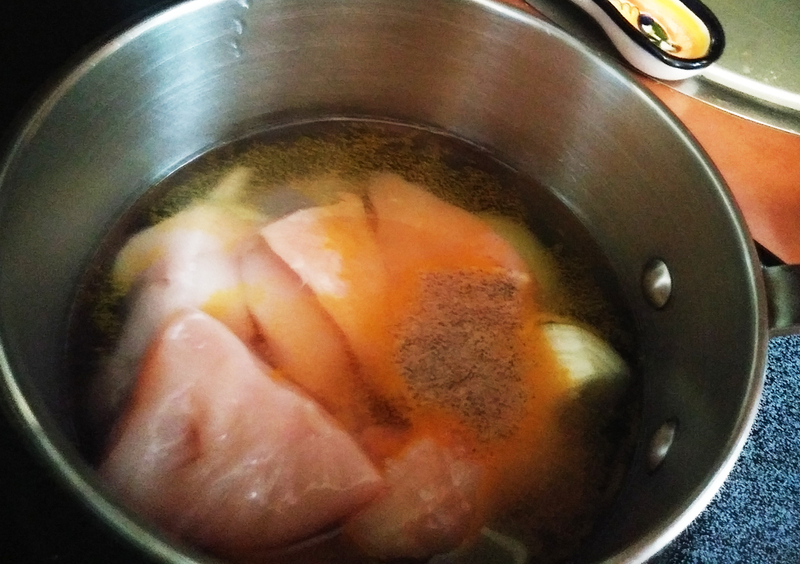 In a medium pot, place chicken breast chunks, 1 cup of water, onion, salt, turmeric and black pepper. Cook until tender. In a big bowl, beat the eggs with a bit of salt. 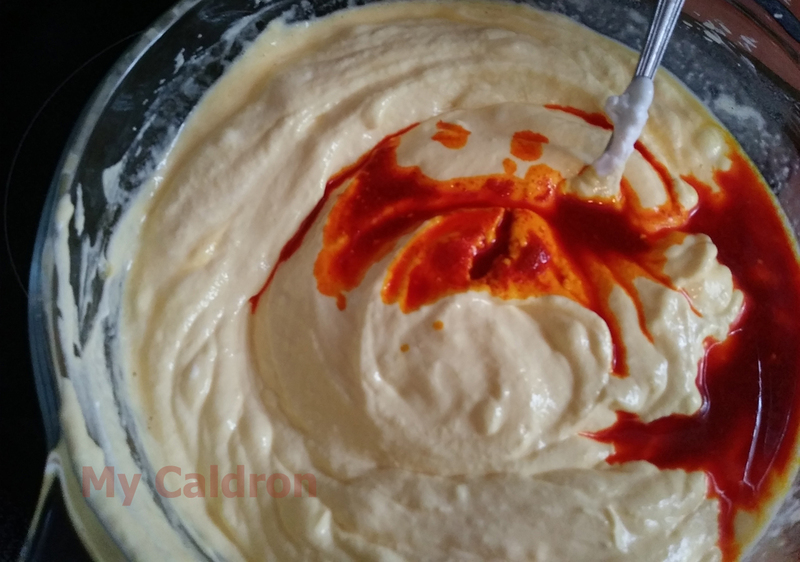 Add yogurt, ½ cooking oil and the diluted saffron and mix well. 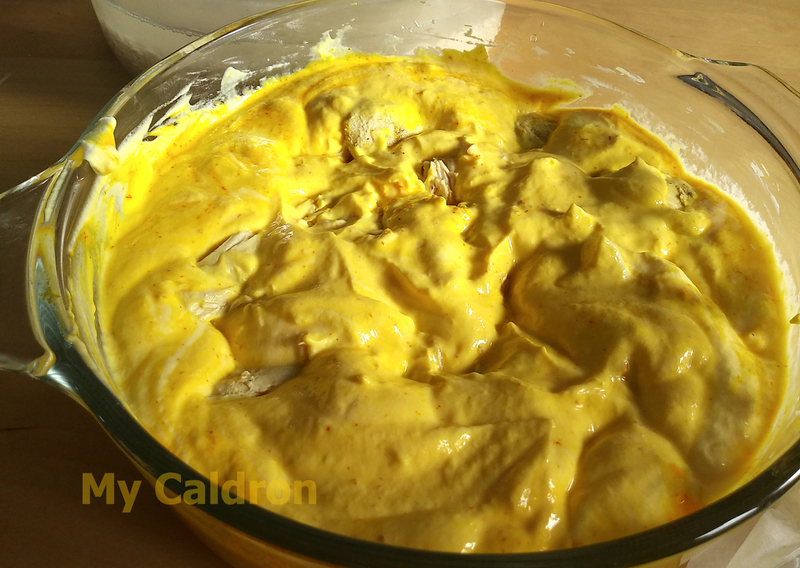 Take the cooked chicken breast out of the pot and place in the yogurt mix and place in the fridge for 30-45 minutes. Bring 9 cups of water to a rolling boil in a big non-stick pot with a capacity of 18 cups of water. Pour off the salted water from the top of your rice bowl and add the rice to your boiling pot. Let the rice boil for 5-7 minutes or until cooked at the core but not soft. For tahchin we want our rice grains to be a bit harder than normal. 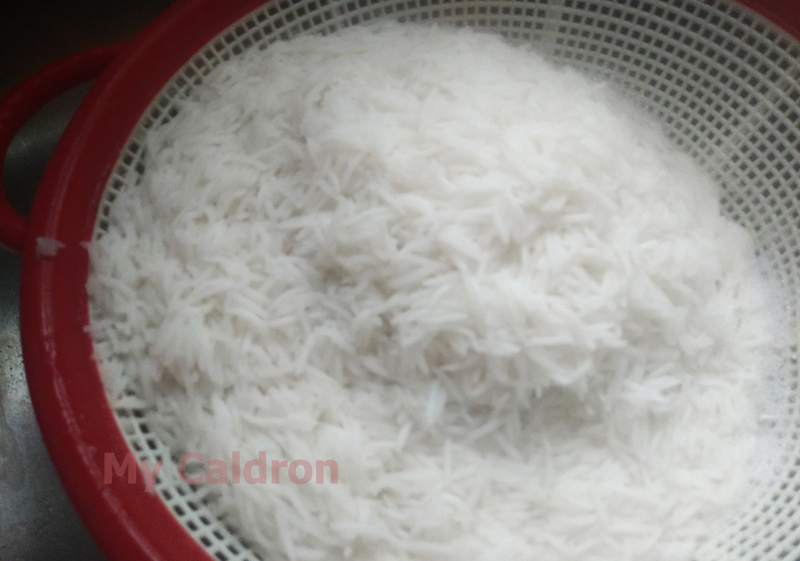 Drain in a fine-meshed colander and rinse with cold water. Wash the starch off the pot and put it back on the top of the hot stove to get it completely dry. Take chicken breasts out of the yogurt mix and place them on a plate. 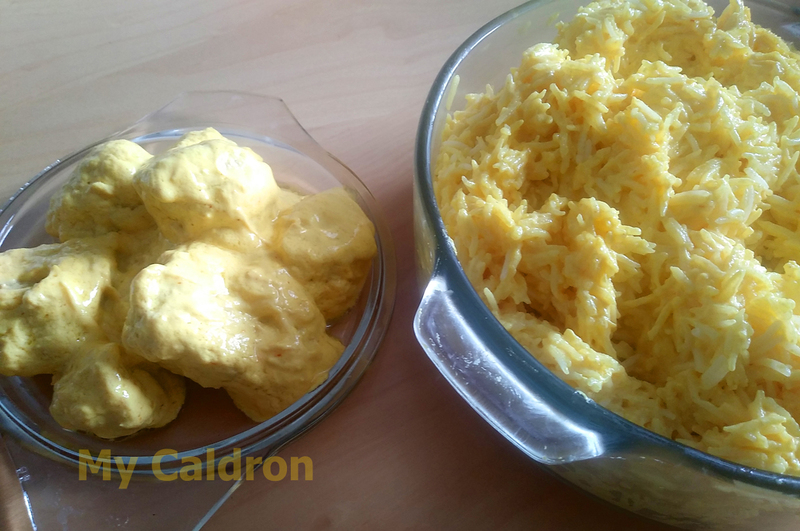 Now transfer the drained rice to the yogurt mix and gently mix so that all rice grains are covered in yogurt-oil-eggs-saffron mix, without getting broken. Back to your pot on the stove, turn the heat on medium and pour the remaining ¼ cup of oil in the pot and make sure the inside walls get greasy too. Pour half your rice into the non-stick pot, then place the chicken breasts on the top of the rice evenly and gently press them down with the back of a spatula. Add the rest of the rice and flatten the surface. Cover the lid in a clean towel and put it back on the pot. After two minutes, bring down the heat to minimum and steam cook the tahchin for 90 minutes. Remove from the heat. Take the lid off. Place a round serving plate on the top of the pot and flip the tahchin into the plate, just like when you flip a cake. Use a knife to cut through in a rectangle shapes. 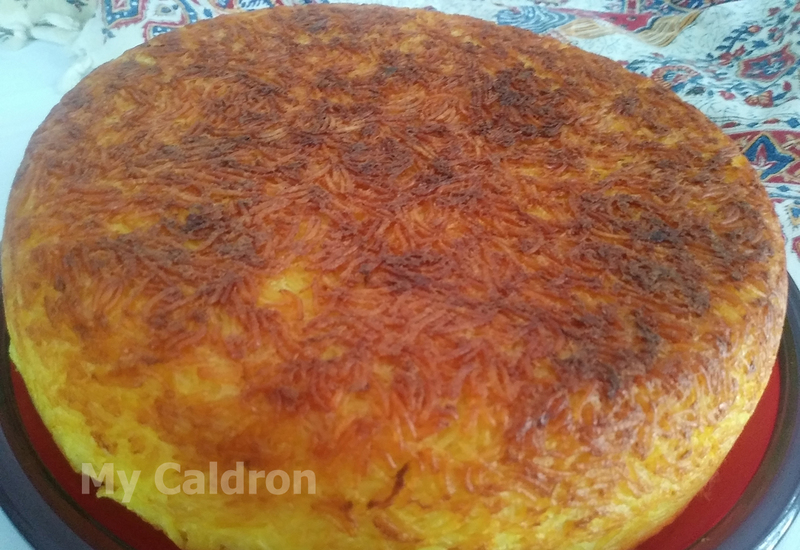 An authentic well- prepared tahchin should have a reddish-golden tahdig which looks very appetizing and beautiful on its own and won’t need any kind of topping. And it should of course be very tasty, and delicious. Because of the oil content of the dish, tahchin becomes harder and sticker after spending a night in the refrigerator. Hope you try my auntie’s tahchin style and enjoy every bite of it!